As a rugby fan, Sean had two great passions – Munster and Ireland, probably in that order. He was also a keen follower of Leinster and the Lions, and any team with Irish involvement. Sean started to watch rugby on television with me when he was 10 or 11. Munster’s Heineken Cup exploits caught his imagination, and soon he and I were in the adjacent field with a rugby ball. Sean joined the local Virginia Rugby Club and played with the under-12s … an unstructured type of game involving both boys and girls. He also played for the under-14s – a different kettle of fish – while still an under-12. His coach, when I introduced myself, said ‘Sean’s a fanatic’. The following season, 2004/2005, Sean played for Virginia under-14s. I was asked to help out with the coaching, and did, so I attended all the training sessions and matches. Sean was a talented player. 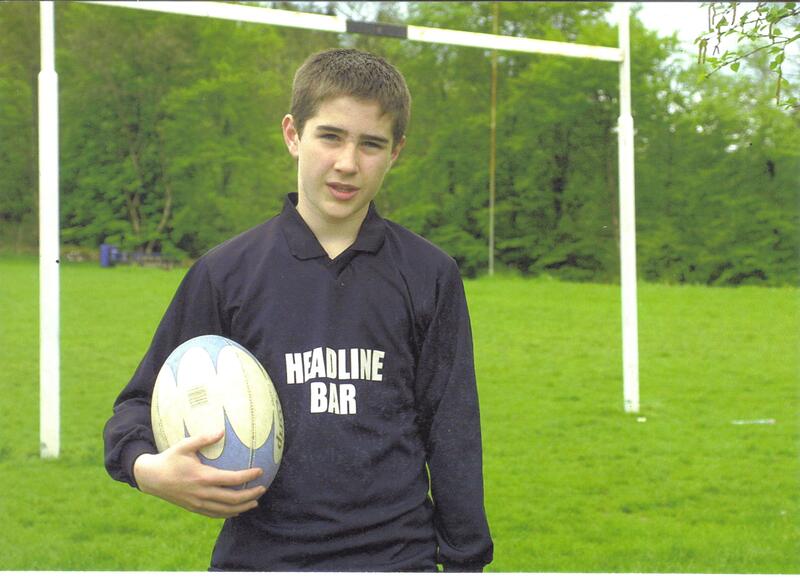 He played everywhere in the backs except scrum-half, and he could have played there too. He was fast, well-balanced and brave, and ran good lines … he loved above all else to run with the ball. He was also a keen student of the game, and always tried to learn from the matches he watched on television and from talking to coaches. He received the Virginia under-14 ‘player of the year’ award. Sean qualified for the under-14s again in 2005/2006 … I was the coach, and we travelled to all corners of our province (Ulster) to play matches. He also played some under-16 matches (sometimes an under-14 and an under-16 match on the same day). At the end of the season he became involved in the under-16 Ulster trials, playing for a team representing Counties Cavan and Fermanagh. Perhaps his proudest moment was when he was out-half as Cavan/Fermanagh (a poor relation in rugby terms) beat Belfast … I wasn’t at that match, but was told that Sean played ‘out of his skin’. At this point he wanted to be a professional rugby player. In 2006/2007 Virginia didn’t have enough players for an under-16 team, so Sean joined the Cavan club, and I again helped with coaching. The team was expected to do well, but there were disciplinary and other problems and the season ended up being a bit of a disappointment, although it was an interesting experience. Sean played in the Ulster trials again, but the Cavan/Fermanagh team was weak and he wasn’t able to make an impact. That Easter, Sean and I travelled to England with a Cavan party for a tournament in Portsmouth, staying at Butlin’s in Bognor Regis. Sean played full-back, and did very well. The photo I posted of him in a red rugby jersey was taken then. His feet were blistered and bandaged on account of the hard pitches. We didn’t realize it at the time, but that would be the last serious rugby he ever played. He was still only 15. The following season we decided that he should take a year off to concentrate on studying for his Leaving Cert. He didn’t go back afterwards. A week before he died I asked him whether he thought he would ever play rugby again. He said that he might well go back to it in a couple of years’ time. He still loved the sport, but hadn’t managed to fulfil his great potential. I remember him well as the 11-year-old who constantly wanted the ball and to run at the opposition, and scored tries galore. The following is a match report I wrote for a local paper (purely from the Virginia point of view). After a disappointing defeat by Cavan the previous weekend, Virginia under-14s bounced back in this league match at Deerpark, outscoring their visitors by eight tries to one. Virginia got off to a great start with a clever try by Seán O’Brien in the opening minutes, then the other centre, Tony Sheridan, who had scored Virginia’s only try against Cavan, made a typically strong burst to the line to score. Second-row David Smith was next to breach the Dungannon defence, with a good try which out-half Owen Healy converted. Dungannon tried hard but found the going difficult against Virginia’s tough tackling, accurate passing and good support play. They managed to score a penalty, but couldn’t stop O’Brien from running in another try before half-time to leave the score at 22–3. Virginia kept up the pressure in the second half, and Sheridan scored another fine try. O’Brien completed his hat trick and hit the post with the conversion attempt; then prop Dwayne Tranmer made a great run to score a try, which O’Brien converted from close to the left touch-line. Sheridan completed the Virginia scoring, and his own hat trick, when he stole the ball in his own 22 and ran the length of the pitch to touch down. Virginia finally let their guard down in the closing minutes, when Dungannon crossed the line for a deserved try. This was an excellent team performance by Virginia. All fifteen players can be proud of their hard work and commitment, in training as well as on match day. The forwards put Dungannon under huge pressure in the scrums, line-outs and loose play, and the backs ran hard and straight to create the openings. Oops! Sharp-eyed readers may have noticed that there is a tiger in the second pic, which I forgot to mention. Thank you, Ike. It’s important to me to have a record of different aspects of Sean’s short life. Brendano you must be so proud. I love that stuff about “good lines” and running with the ball; clearly he was full of the joys of rugby and together you must have been a formidable team, as coach and player! At the age of 14 and 15 I was playing football in the local park. I had to wear the same shirt. It has been washed so many times its natural red colour had faded to a deep pink. I can almost visualise video footage of Sean running through with the ball. Your writing provides lovely Rugby images Brendano, and these images and memories are your for ever. PS I was photographed once with Geoff Hurst, the ’66 hat-trick man for England. It was the occasion of a Scotland England game at Hampden. The English players were staying at Troon I think, next to a golf course. Ron Greenwood was then the Manager and Geoff Hurst part of the back-up team. I wasn’t God’s gift to coaching by any means, but I did my best and enjoyed it … running around with the boys was a good way of keeping fit. I was never too hard on them; in fact I may have been too easy. A couple of Sean’s old coaches called to the house last week … one of them has good memories of playing draughts with him in the clubhouse. 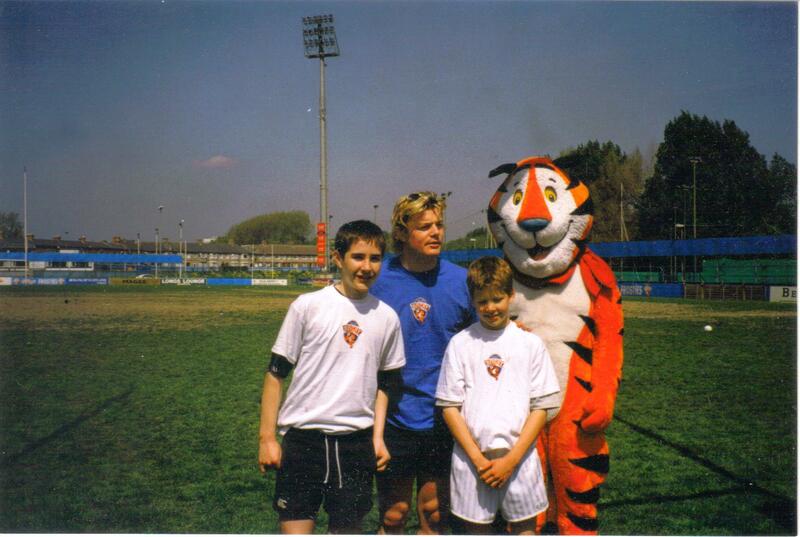 Sean got to do a training session with O’Driscoll through a radio competition (Frosties, hence the tiger). He found it frustrating, as most of the kids there merely wanted to meet O’Driscoll, whereas Sean wanted to do some serious training and pick up some tips. Brendano, i belive with my whole heart you are a great father i remember your beloved son with your words and i admire your patient.. The power of love is a fine tribute and I think says it all. Good luck. One so young and talented. Thank you, tigerbrite … nice to see you. I remember that match very well. . . . It was one ov our greatest ever performances as a team . . We all deserved man of the match that day. . . Thanks brendan for including me. Thanks for the comment, Dwayne … it’s nice to hear from you. You were a good and brave player, you always did your best and you did everything the coaches asked you to do. I enjoyed those days, and I’ll always remember them.